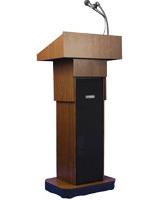 Looking for a facility or commercial lectern that can handle large spaces and offer clear audio quality to large-capacity crowds? 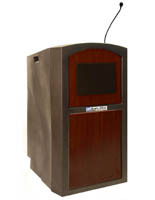 Our podiums with sound systems are designed for indoor or outdoor use and come with a range of audio-visual options to accommodate almost any physical location, environment, or audience size. 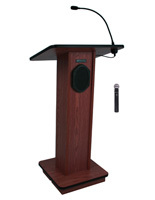 Designed for addressing large audiences at church, in auditoriums, or other public venues, these speaking stands include a variety of audio options including amplifiers, receivers, speakers, and powered wired or wireless microphones. 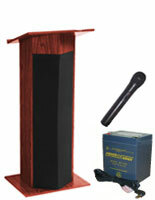 Commercial quality podiums with sound systems come in wood or polyethylene models in a range of finish colors. 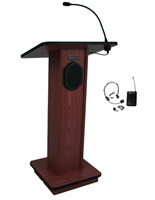 Styles range from simple speaking or presentation stands with a built-in mic to lecterns with full audio setups including recievers, transmitters, and speakers. 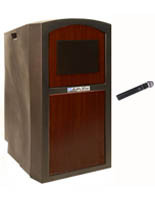 Indoor and outdoor podiums with sound systems offer many different microphone modes to choose from as well, offering standard wired options that mount directly to the reading stand to portable wireless versions that offer speakers freedom to move about at will. 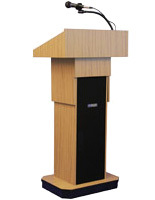 What options are available for public address lecterns? 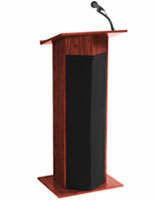 Podiums with sound systems for interior use come in four melamine laminate finishes: light oak, medium oak, walnut, and red mahogany. 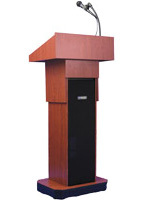 Lecterns with adjustable columns can rise in height from 38" to 44" with pneumatic dial control. AV speaking stands have control panels that are fully integrated into the lectern body with easy-access controls. 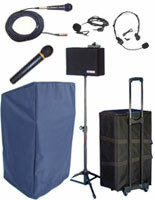 Choose from wired microphones, handheld or attached to a gooseneck, or opt for wireless models with lapel and headset mics for ultimate freedom from cords. 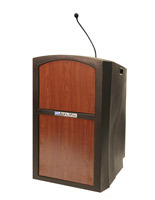 Exterior presentation stands are made from weatherproof polyethylene with decorative front panels in matching or contrasting colors and finishes. 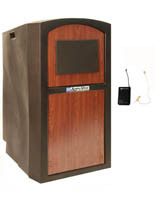 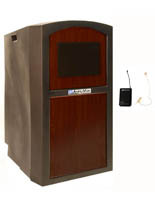 These audio podiums are manufactured by AmpliVox and Oklahoma Sound for professional quality sound amplification. 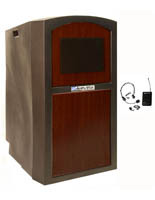 Designed for up to 20,000 sq. 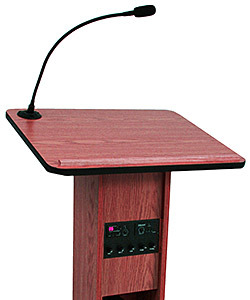 ft. auditoriums with audiences reaching 2000 people, our public address lecterns are fixtures that can handle larg-scale events, and not just conference rooms. 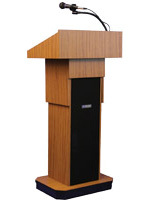 These indoor and outdoor lecterns are also portable thanks to the concealed casters in the base of each speaking stand. 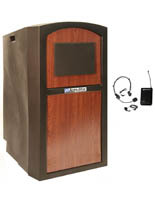 Simply tilt the lecturns on the rear wheels and roll to where needed. 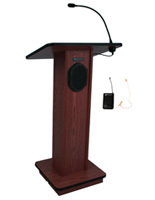 With Bluetooth® capability, Jensen speakers, and amplifiers that reach up to 150 Watts of power, it's easy to see the importance of providing an audio podium that can handle events, guests, speeches, and sermons in public facility environments.